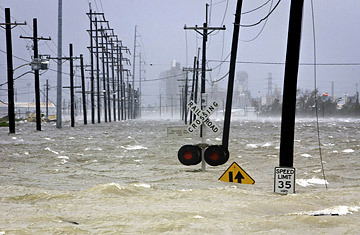 A street at a railroad crossing near the Inner Harbor Navigational Canal is flooded as Hurricane Gustav hits New Orleans. Does Climate Change Result in Stronger Hurricanes? It could be a sign of just how traumatic 2005's Hurricane Katrina was that when Hurricane Gustav failed last week to fully pulverize New Orleans, it was news. The fallout from Gustav was relatively limited, but it was still a major storm, with maximum sustained winds of 110 m.p.h. when it made landfall in Louisiana  strong enough to cause an estimated $20 billion in damages. And Gustav won't be the last this season. Hurricane Hanna gathered strength in the Atlantic last week, and Ike is swirling not far behind, headed now for the U.S. That's just in the Atlantic, this month. Last May in the Pacific, the massive Cyclone Nargis killed an estimated 100,000 people in the Southeast Asian nation of Burma. Storms tend to run on multi-decadal cycles, so it's difficult to tell from year to year whether the number of hurricanes is really on the rise. So far that doesn't seem to be the case, with the overall number of storms worldwide holding about steady  in fact, some scientists argue that warming might actually bring about a reduction in the overall frequency of storms. But the Nature paper argues that warmer sea-surface temperatures will result in stronger storms, because hotter oceans mean the developing storms can draw more warm air, which powers the storm. "Hurricanes are driven by the transfer of energy from the ocean to the atmosphere," says Kerry Emanuel, a meterologist at the Massachusetts Institute of Technology. "As water warms, the ability of water to evaporate goes up, and a greater evaporation rate will produce a more intense hurricane." So far, tropical ocean temperatures have risen by about 0.5 degree C since 1970, which could explain the more powerful storms. The Nature researchers estimate that every 1 degree C increase in sea-surface temperature would result in a 31% increase in the global frequency of category 4 and 5 storms. Given that computer models indicate that ocean temperatures could rise by up to 2 degrees C by 2100, those are scary calculations. It's especially worrying because the most intense storms do the most damage by far  several minor storms can equal the damage of a single severe hurricane. "The category 1 or 2 storms don't do that much," says Emanuel. "It's the 3 and 4 storms that really do the damage, and we could see more of them." Not everyone agrees. Records of past hurricane strength are less than perfect, so it's difficult for scientists to be sure that the recent increase in storm intensity hasn't occurred before, in the years before the Earth started warming. And the weather  as we all know  is complicated, which means that it's difficult to model precisely how future warming might affect the formation of storms. Climate models work well on a global level, but they can rarely be applied accurately to areas smaller than 200 square miles  which happens to be larger than many storms. "It's not just a simple relationship with sea-surface temperatures," says Curry. "It's more complicated than that. We need the models to get a lot better."